What does it mean to innovate "around the box?" It’s developing a family of complementary products and services that help deliver on a single business promise. It’s a proven approach that dozens of companies have adopted with great success. Robertson is an accomplished speaker who has entertained audiences around the world. His talks are interactive, tailored to the audience, and usually involve some exercise and giveaway to keep the audience active and engaged. As one event organizer said, he “delivered a talk that was both thought-provoking and entertaining” and “left the group buzzing with ideas.” He has a range of different talks that can be tailored to any audience and event theme. He can customize the talk and personalize the giveaway item to make your event truly memorable. Managers are bombarded with dozens of theories for how to manage innovation. LEGO over the past two decades has tried them all – blue ocean strategy, full spectrum innovation, and disruptive innovation, to name a few. None of them worked. Learn the strategy that led LEGO to nine years of 20% annual sales growth. Much of the business press focuses on big, world-changing innovations—innovations that will “disrupt” industries, lead companies to “blue oceans,” and revolutionize markets. Using stories from industries as diverse as financial services, fashion, grocery, and used car sales, David illustrates this proven approach to innovation. Leading company transformations is hard, no matter when it happens. But it can be even harder when things are going well. A crisis is a great way to focus attention and gain agreement that changes are necessary, but what do you do to make change happen when things are going well? Leading innovation is a difficult job. And while most of the success or failure of a new innovation project is determined in the first 90 days, early mistakes often don’t reveal themselves until much later. What can new innovation leaders do in their first 90 days on the job to ensure success? "He entertained the audience with one of the best-received presentations of the conference"
"Robertson's 'Cards Against Innovation' game engaged the group, got them laughing, and left them with specific ideas where they could innovate"
From a three hour overview to a three day deep dive, Robertson’s workshops are interactive, thought-provoking, inspiring, and practical. Tailored to each group’s needs and situation, Robertson brings new insights and draws from industry-specific case studies to illustrate them. Every workshop will leave participants with clear ideas that they can apply immediately. "A real high point of our congress"
“I’d seen David present before at an international business conference and when we were planning our Congress with innovation as the main theme, he immediately came to mind as our first-choice keynote speaker. "David Brings Clarity To An Often Ambiguous And Complex Discussion"
""A real high point for our congress""
Have you ever played Apples to Apples or Cards Against Humanity? Then you know how creative people can be when given the opportunity. 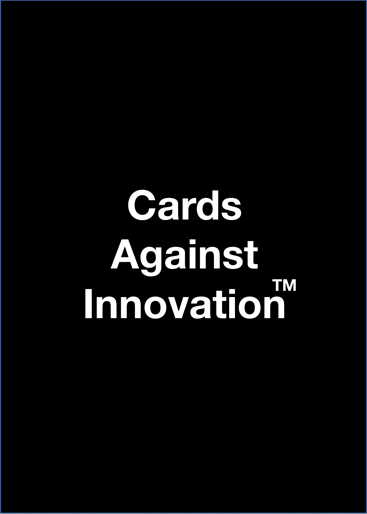 Cards Against Innovation uses the same simple approach as those other games: the Innovator chooses a black card that best represents their innovation challenge. The other players choose from the white cards to solve that challenge.